The lifecycle of an application consists of several phases. Depending on your process, you’ll find at least two of them: A development and a production phase. In this tutorial, you will learn how to take an app from development to production by deploying it with the one-click deployment tool Apex Up. During development, you’ll usually test your software locally. When you’re working on a web app, this means you’re running a local server and access your application on http://localhost:4000 (or some other port). http://localhost however is not a domain that people on different machines than yours will be able to access over the web. That’s why you need to deploy the application. Just few years ago, deployment was an extremely cumbersome process where you needed to get access to some physical server and do an awful lot of manual configuration work. Today, all this nitty-gritty is abstracted away by great services like Apex Up or Zeit Now. Apex Up is an awesome one-click deployment tool for AWS Lambda. Lambda itself is a great service for deploying serverless functions and even entire web servers — but it doesn’t have the best developer experience around it. Up provides a simple and intuitive interface to Lambda so you don’t have to deal with the tedious AWS tooling. The easiest way to get started with Up is by following the quickstart instructions in the README. When deploying an application with Up, all you need to do is invoke the terminal command up inside the root directory of your project. This assumes the presence of a file called up.json inside the same directory — if there is none, the up CLI will prompt you a few questions right inside the terminal and create it for you. Because Up uses AWS Lambda under the hood, you need to be able to authenticate with AWS when using it. This authentication is done by storing the AWS credentials on your machine. If you have used the AWS CLI before, you likely already have credentials being stored on your machine. The --upgrade option tells pip to upgrade any requirements that are already installed. The --user option tells pip to install the program to a subdirectory of your user directory to avoid modifying libraries used by your operating system. You can find more info here. If you need more help with setting up the credentials, you can check the corresponding section in the Up documentation or AWS directly. In this tutorial, you'll use the node-basic GraphQL boilerplate project as a sample server to be deployed. 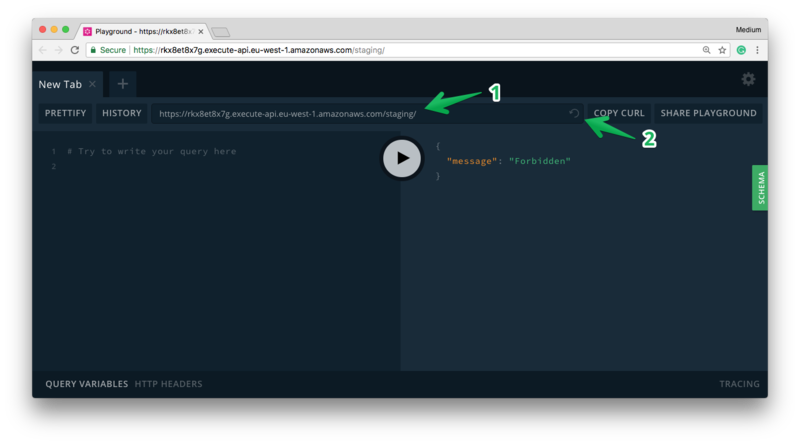 The easiest way to get access to this boilerplate is by using the graphql create command from the GraphQL CLI. The boilerplate project is based on graphql-yoga, a lightweight GraphQL server based on Express.js, apollo-server and graphql-tools. When prompted where (i.e. to which Prisma server) to deploy your Prisma service, choose the Demo server option. Note that this requires you to authenticate with Prisma Cloud as that's where the Demo server is hosted. The above graphql create command creates a new directory called hello-basic where it places the source files for your GraphQL server as well as the configuration for the belonging Prisma service. You now have a proper foundation to deploy your GraphQL server. When deploying a web server with Up, all you need to do is navigate into the root directory of that server and invoke the up command. As mentioned above, this command either expects the presence of an already created up.json file or will create one for you if it doesn’t exist yet. AWS Profile: If you have setup your credentials correctly, up will provide a list of profiles to choose from. If this doesn’t work, go back to the previous section and properly configure your credentials. AWS Region: In order to get the best possible performance for your server, be sure to deploy the GraphQL server to the same AWS region as the Prisma service. If you chose demo-eu1 as the target demo server for your Prisma API, select the EU (Ireland) region — in case you chose demo-us1, select US West (Oregon). After you’ve provided the required information, up will take the files inside the project directory and deploy them to Lambda (note that this can take a few minutes). On Lambda, the server will be started by invoking the start script inside package.json (basically it will just use yarn start or npm run start). The start script looks as follows: node src/index.js. This opens a browser and points it to the URL where the GraphQL server was deployed (when omitting the --open flag, the URL just gets printed). The browser shows a GraphQL Playground you can use to interact with your GraphQL server! There’s still a minor problem however: The schema is not yet loaded and you won’t be able to send any actual queries to the API. The /staging path that’s appended to the URL indicates the stage of the deployment. Up supports two stages: /staging (default) and /production. To deploy to the /production stage, you can simply run up production. In this part, you’ll learn how to configure environment variables when deploying with Up. Environment variables are a best practice to quickly switch between different deployment stages of your server. For example, during development you’ll commonly want to run your server in a development environment. The development environment uses a different database than your production environment. This ensures you’re not accidentally messing with actual user data when developing a new feature. Only once you’re confident the new feature works as expected, you’ll deploy it to production. Environment variables are a great way to distinguish between environments by pointing to a specific database. Another common use case for environment variables is to provision secrets to the build environment. It’s likely that your database requires some sort of authentication, or maybe you’re using 3rd party services that require to provide API keys so you can access them. This kind of secret information is also commonly provided through environment variables. Similar to before, you’ll start by bootstrapping a GraphQL server. Just like before, deploy the Prisma service to the Demo server in Prisma Cloud. ATTENTION: One thing that is really important to realize when deploying GraphQL servers to AWS Lambda is that realtime functionality based on GraphQL subscriptions do not work! The reason for that is that subscriptions are implemented with WebSockets and the server needs to maintain a pool of connections to the subscribed clients — the server is hence stateful. However, AWS Lambda does not support stateful apps! Lambda works in the way that it provisions infrastructure for the servers on-the-go and tears it down when not needed any more. The teardown breaks any connections from previously subscribed clients! # The endpoint of your Prisma API (deployed to a Prisma Sandbox). # The file containing the definition of your data model. # Seed your service with initial data based on `seed.graphql`. # `src/generated/prisma.graphql` (as specfied in `.graphqlconfig.yml`). # to the `Authorization` header of HTTP requests made against the Prisma API. In index.js, one environment variable is referenced when instantiating the Prisma binding object. With process.env.PRISMA_ENDPOINT, the code expects that an environment variable called PRISMA_ENDPOINT is set. (Note that the same holds true for PRISMA_SECRET if the comments for it are removed from index.js and prisma.yml). Similarly, prisma.yml provides the values for three of its five properties using environment variables. In addition to PRISMA_SECRET, it also references a PRISMA_ENDPOINT. However, this approach is often not practical (or at all feasible) when working with state-of-the-art deployment and continuous integration tools, such as CircleCI, Buildkite, Zeit Now or Apex Up. This is because you don’t have direct access to the build environment — you cannot just ssh into the machine that’s going to build and start your server in order to set environment variables. Instead these tools provide you with custom mechanisms for setting environment variables, or follow best practices for doing so. In the case of Up, environment variables can be set by adding an environment object to up.json. Note that Up Pro also offers an additional up env command to encrypt and manage environment variables. The node-advanced boilerplate is configured to use .env files in combination with dotenv by default. Notice that the PRISMA_ENDPOINT will look slightly different for you. To test the app, you can send the same query from above again. To see what other operations are available, check out the interactive API documentation right inside the Playground. 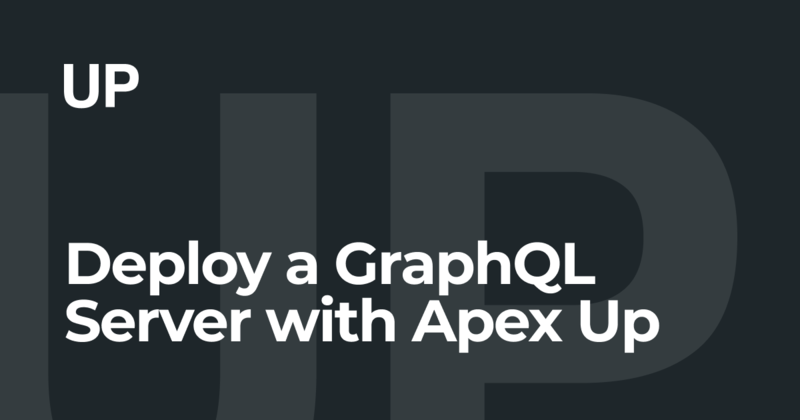 In this tutorial, you learned how to deploy a GraphQL server with Apex Up, an awesome one-click deployment tool. As sample GraphQL servers to deploy, you used the node-basic and node-advanced GraphQL boilerplate projects. Deploying node-basic was straightforward since all required configuration was hardcoded in the project. For the node-advanced project, you used environment variables that you configured by using the custom mechanism provided by Up.